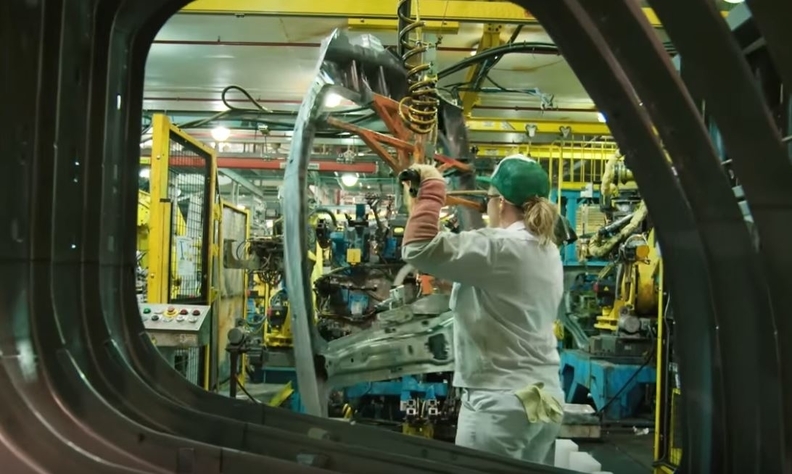 DETROIT -- Steel blanks supplier ArcelorMittal is lining up auto customers for a patented, innovative approach to vehicle door rings, in which inner and outer rings are combined into a single, large component that is lighter and stronger than the traditional rings. ArcelorMittal is quick to give credit to customer Honda Motor Co. for proposing the idea and guiding the global steel giant and its French r&d operations to success with it. And now that the door rings are going into Honda vehicles, the automaker doesn't mind that the innovation is being shared across the industry -- and it is not getting a royalty from the supplier. In addition to being used in Honda's brisk-selling 2019 Acura RDX crossover, the ArcelorMittal door rings are now going into Fiat Chrysler Automobiles' 2019 Ram 1500 pickup. And the supplier says it's participating in 20 other vehicle design programs for the ring. "This was an innovation in vehicle safety," said John Dirrig, chief engineer responsible for corporate & technical communication at Honda R&D Americas Inc. "It protects passengers in the event of front or side impact. If we've helped ArcelorMittal help other automakers reduce injuries, we're fine with that." But the seemingly simple task of combining an inner and an outer door ring was a bear of a challenge, says Manish Bhatt, senior project engineer, product development, for the supplier's Tailored Blanks Americas unit. For starters, the two steel circles — as large as an SUV doorway — traditionally occupy different parts of a vehicle's build order, with the inner ring treated as an integrated part of the chassis. Even more challenging, Honda asked for the complex component to be hot-stamped and laser-welded to give it greater strength while also removing weight from the vehicle. "Honda wanted us to take this to the next level," Bhatt told Automotive News this week at the ArcelorMittal stand during SAE International's WCX World Congress Experience here. "In the end, we were able to deliver [42 pounds] in weight saving." Honda also pressed the supplier to reduce manufacturing costs with more efficient laser welding. The unit has five seams on the inner door ring and four seams on the outer. Laser welding costs threatened to inflate the price tag, because the system had to be laser-welded on both sides, requiring two pass-throughs. But ArcelorMittal hit on an innovative solution. The supplier designed a tabletop fixture that would hold the system while both sides were laser-welded in the same process. But the table represented a $500,000 investment, and ArcelorMittal believed the procedure required two separate tables. Honda balked at the expense, and the supplier went back to the drawing board. In the end, ArcelorMittal made it work with one table, which took 14 months to design and perfect. But once the supplier had it figured out, it enabled a 500 percent increase in efficiency, Bhatt said. "We're still working to improve it," Bhatt said of the door-ring system. "We know the concept works -- we just want to take more cost out of it."